This was all different. It may have scared off the other guys that there was a female in the bunch. So Julie and I remained the only ones on the deer application. Weeks later luck struck as the mailman delivered first choice tags for the Prescott woods. Opening weekend was tough. The place had dried out thoroughly. Worse, no wind made the forest so very quiet. Every step made noise, sneaking around was just plain out. We saw does every day, plus some deer I could not identify as they excused themselves way ahead of my arrival. Julie did get a rush of deer fever when a herd of about 8 mulies, stirred by two other hunters, ran within about 70 paces of us and stopped, nervously milling around. We checked between all those ears for signs of testosterone. None. Our Remingtons remained silent on those first three days. We did see one buck, decent one at that, but he was safe ‘n sound next to the pavement on our way back to town in almost darkness, too far past legal hours for sure, and probably in somebody’s front yard. Spending the nights in a motel was definitely breaking tradition. But while I can easily live out of my Toy for a few days, this was Julie’s first hunt ever, and the back of the 4Runner for some reason did not appeal to her, not at all! The second Saturday found us back just off the Senator Highway. There’s a section of trail, well marked, that we followed at first light. It did not lead to, or by, any critters. Julie still has trouble from knee surgery. So she stayed behind, overlooking a decent chunk of rolling wooded hills, while I looped back to the vehicle. When I returned to pick her up, we both had seen no deer, period. That changed minutes later on our ride back when a doe appeared in the road ahead, then a second. I stopped, ordered Julie to get out, then exited the SUV myself. More deer appeared as we inched into better positions to check them out. All seemed to be does, until antlers appeared on two of them, the furthest to our left! Another careful step or two, and we both were in shooting position. It took a fair amount, no, a huge amount of self-control for me not to squeeze the trigger. 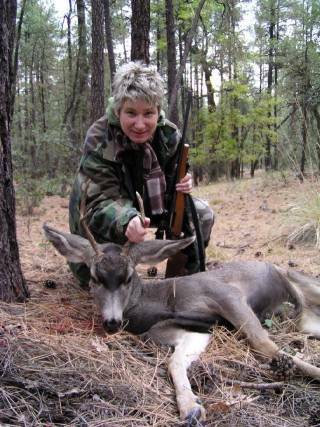 Seconds later, Julie’s 7mm-08 boomed, making the buck jump, and all others flee into the wooded hillside. No chance for me to shoot, too many trees in the way as the deer disappeared behind the first hump. I walked up after them, and saw only one doe. Slowly walking in a generous circle let me find her forkhorn! 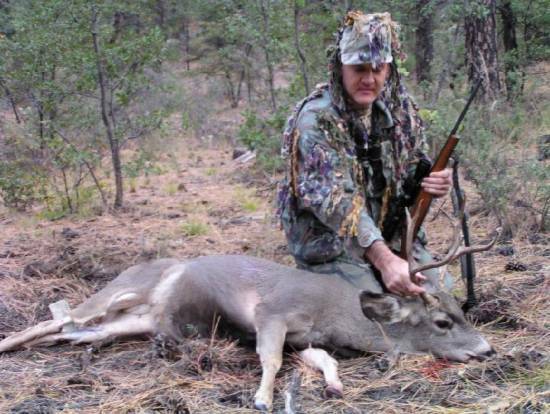 This fellow had more antler mass than all but one of the seven or so mule deer I had the great fortune of bagging in that hunt area. The 150 gr. Ballistic Tip had ripped high through the boiler, allowing the buck to go about fifty paces before the lights went out. This had instantly made it a very successful hunt. I rushed back to congratulate her. I have never seen such professional knife work! 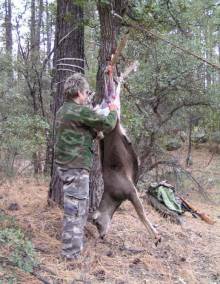 So it required more time, but Julie not only gutted her buck, but after we dragged it to the road and the Toyota pulled it up a tree, she also skinned him, wanting the hide for a rug. That gave me time to sneak back after the group -- without success however. I returned to help with the de-boning. Yes, we had along a board, had the perfect-enough stump, and by 1PM all of the forkhorn was ready for departure. I drove to where the deer appeared to have headed, and gave chase, leaving Julie in the passenger seat to read a book. Scared the herd up again, but could neither identify a buck, nor shoot. More deer enlightened the rest of my afternoon, just no horns. On our ride out we met one more bunch of mule deer and studied them until light faded. Aside from a male fawn receiving some attention, that herd contained nothing matching my tag. But hey, it already had been an awesome day! Broke tradition again that night. We returned at first light. On our way back to the general area where the confirmed buck most likely was roaming, the same group of deer from the night before met us. Without excitement the binoculars wandered from one head to the next, confirming that they were still female. Things accelerated suddenly as my eyes detected motion to our left! He had enough antlers to make it obvious! I grabbed the rifle, the 7mm-08. It was closest. Maybe deer aren’t that stupid. The buck had stopped exactly where I needed a few tender steps (you know the kind -- they seem to choke you because of the acute danger of scaring your quarry into panic flight) to get his chest cleared by a big pine he’d parked behind. The crosshairs settled in that narrow corridor behind the shoulder and just clear of the bark. Pressure from my trigger finger mounted until the recoil shoved the rifle back at me. When I recovered my buck was already at full throttle. A hasty second shot pathetically plowed into the dirt behind him as he made a sharp left turn to disappear over the hill. With the dust cloud slowly fading, my mind had only one ugly thought: did the 150 gr. Nosler Ballistic Tip hurt that fat pine tree? Once two fresh rounds topped off the Model 7 we approached the tree, all calm now. No, there was no sign of injury, no bark missing. Next then was the spot where the buck had bolted from. Obvious dig marks with pine needles and dirt below torn away left no doubt. And before I could finish my sentence to see if any . . . “Here, blood, and there’s more!” Julie announced almost too loud for my taste. I was quite relieved, yet reminded her in an unfriendly manner to gently whisper. I again experienced what I had learned a few years ago when trailing David’s archery buck, I have a weakness to see the red thick fluid on top of brown pine needles. So it was Julie who was always at least one step, one drop ahead following the buck’s path. It concerned me greatly that this blood was dark, for I much favor the pinkish foamy type that clearly testifies to lung damage. Only once, when there apparently was no blood for several steps, did we make progress when I pointed at the faint tracks of disturbed needles. From there she picked up more blood, and ultimately led us to him! He had gone over a hundred steps, again on a shot too high through the lungs. For this area, compared to previous kills, this boy was large in body. He wore four by three headgear with some chunks of ugly velvet still attached. We repeated the gutting, skinning and butchering routine, and headed home early afternoon, quite satisfied, with buck and buck.